Great news for Panther Hollow and the 4 Mile Run Watershed! The Pittsburgh Parks Conservancy just received a 1 million dollar grant to go towards restoring Panther Hollow Lake and the Panther Hollow Watershed! Half the grant will be used to provide funding for a watershed management plan while the other half will go towards necessary management and maintenance projects. Read more at the Pittsburgh Parks Conservancy website. 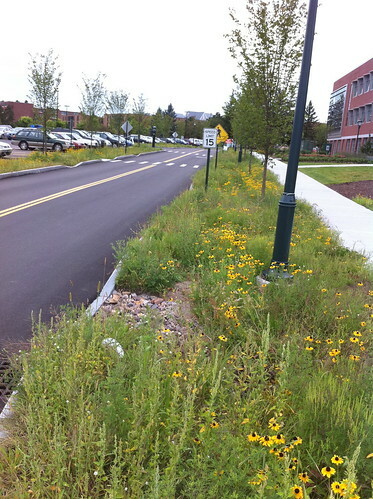 The new Jeffords Hall building on the University of Vermont campus in Burlington, Vermont includes some landscaping designed to slow down runoff and infiltrate it into the groundwater. Runoff from the area would otherwise probably end up in Centennial Brook, the Winooski River, and then Lake Champlain. 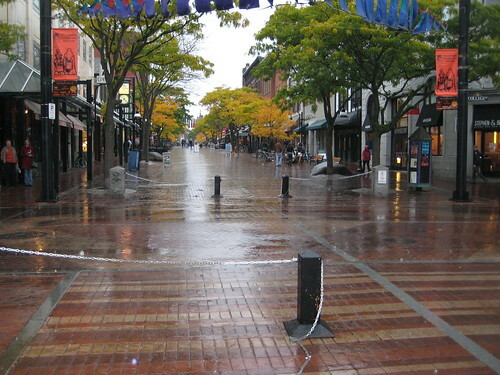 This area collects water from a roadway. It isn't really a rain garden since there are drains in the low spots, but this landscaping still allows some of the runoff to slow down and enter the soil. This large area has a small constructed 'creek' flowing through it. I think it could have used a few more meanders but it is still a nice feature. It has been fairly dry since I got back to Vermont, but I will be documenting how these features and others nearby respond to rainfall and snow. It has been well established that destruction of natural habitat can have a variety of negative social, ecological, and cultural effects. What about completely unnatural systems in a place they would never occur naturally? What happens when these are destroyed? Although not natural ecosystems, they can still be very valuable to the local community. These issues recently came up in the urban desert near Phoenix, Arizona, when Tempe Town Lake was destroyed by failure of an inflatable dam. Located in Burlington, Vermont and adjacent to the University of Vermont, Centennial Woods is a small patch of nature (around 65 acres according to the university website) that is owned by UVM and used for research and for recreation by the public. The woods are small and frequently visited, but they are full of very neat places to explore. I wander around in this area as often as I can, sometimes several times a week, and during all seasons and types of weather. It is one of my favorite places. It also shares some interesting similarities to Schenley Park in Pittsburgh. Through some research and through people sending me links, I've found a bunch of neat websites I wanted to share here, involving urban nature and watersheds. Check them out below the pretty picture of Lake Champlain. So there's a lot of talk about 'Impervious Surfaces' - areas such as roads and rooftops that cover large areas in cities and are impervious to water - meaning, basically, that water does not soak in when it hits them, but runs off instead. I have definitely mentioned this in the blog before, but this far in Pittsburgh I hadn't been out in the park during a full-on summer downpour. Yesterday, in my last few days in Pittsburgh for the summer, I was in the right place at the right time. A couple of weeks ago I went to visit Fallingwater, a house designed by Frank Lloyd Wright near Ohiopyle, Pennsylvania. This house was built to be fully integrated into the landscape, including a creek and waterfall. Because I am interested in how people connect to their landscapes, especially in the case of flowing water, I thought this would be a great place to visit. 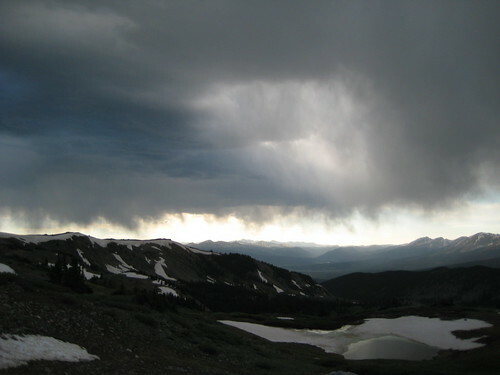 In most of the norteastern United States and adjacent Canada, there is abundant precipitation, and plenty of water. In fact, the Great Lakes alone contain about 84 percent of North America's fresh water. Most rainwater management consists of moving the water away from buildings and roads so it doesn't cause problems. But what about places where water is scarce? Do you own the water that falls on your home? Last month I made a post about the gulf dead zone - an area in the Gulf of Mexico that contains very little sea life, due to input of nutrients from the Mississippi River. According to information I have read in the past, the main contributors of these nutrients are agricultural areas in the vast Mississippi River watershed. However, I also found an EPA study that indicates that sewage discharges (even treated ones) may be a larger factor. I'm not sure which is the leading cause, but it is safe to say that stormwater/sewage overflows as well as runoff from landscaping in Pittsburgh and other cities in this large watershed contribute at least a small bit to this. Recently I found a New York Times blog entry indicating that the Gulf Dead Zone was particularly large and problematic this year. In any event, 'slow water' practices that encourage water to soak into the ground or flow through streams and wetlands are one of the best ways to reduce the amount of these nutrients in runoff. Ironically the nutrients themselves are great for plants - it's only a problem when too much of these vital nutrients enter waterways where they don't belong. Projects like the possible 4-Mile Run Daylighting project in Pittsburgh help reduce this problem in two ways: by reducing the number of stormwater sewage discharges into the rivers, and by allowing wetland and creekside plants to filter nutrients out of the water. Constructed wetlands are also great when placed between treated sewage discharges and rivers, because sewage treatment plants can't remove all of the nutrients from the river. I think this maple tree may be a bit premature. However, in exactly 1 week, my time in Pittsburgh is ending for now and I will be driving back to Vermont where I will continue working on outreach for the Pittsburgh Park Conservancy while attending classes at UVM. I intend to keep this blog going, with posts relating to Vermont, to Pittsburgh, and to anywhere else where I learn neat things about runoff management and water flow. I want to thank everyone in Pittsburgh I have talked to for their input and support. If anyone has any thoughts on this blog, please do leave a post or email me. 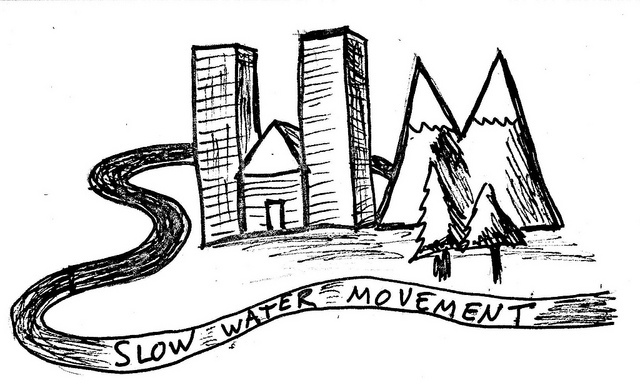 At some point, a similar blog may be created specifically for the 4-Mile Run watershed. This blog, however, will hopefully follow me wherever I go. In June I visited Schenley Park during a rainstorm. However, most of Four Mile Run and other watersheds in Pittsburgh is not parkland, so I thought it would be interesting to watch what rain does in an urban area as well. A line of thunderstorms presented a chance of doing this today. I chose the corner of Bartlett Street and Murdock Street in Squirrel Hill, because this is part of the historic Panther Hollow Run and because there are several different types of pavement in this area. Sure enough, the weather started getting stormy fast. Yesterday I attended a Gigapan training around Panther Hollow in Schenley Park.